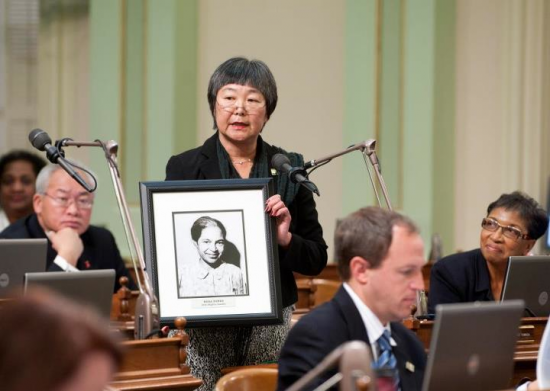 Assemblywoman Mariko Yamada holds up a photo of Rosa Parks. SACRAMENTO – Assemblymember Mariko Yamada (D-Davis), chair of the Assembly Aging and Long Term Care Committee, and Assemblymember Holly Mitchell (D-Culver City), chair of the California Legislative Black Caucus, presented House Resolution 5 on Feb. 4 to honor Rosa Parks’ 100th birthday. Parks was arrested on Dec. 1, 1955 for refusing to surrender her seat on a bus to a white passenger. Her arrest launched the Montgomery bus boycott involving over 40,000 African Americans, which ended legal segregation in public transportation and inspired ordinary citizens throughout the world. Parks’ quiet example has impacted many groups in the quest for social justice, evidenced by representatives of the Women’s, LGBT, Asian Pacific Islander and Latino legislative caucuses joining Yamada and Mitchell in the Assembly commemoration. California designated Feb. 4 as Rosa Parks Day beginning in 2000.